A machine vision system for gauging calculates the distances between two or more points or geometrical locations on an object and determines whether these measurements meet specifications. If not, the vision system sends a fail signal to the machine controller, triggering a reject mechanism that ejects the object from the line. 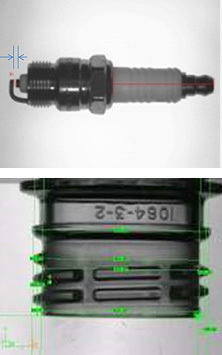 In practice, a fixed-mount camera captures images of parts as they pass the camera’s field of view and the system uses software to calculate distances between various points in the image. Because many machine vision systems can measure object features to within 0.0254 millimeters, they address a number of applications traditionally handled by contact gauging. provide three-dimensional inspection of your products.